Reference. Volcanological Society of Japan, 1980, Bulletin of volcanic eruptions no. 18: Annual report of the world volcanic eruptions in 1978: International Association of Volcanology and Chemistry of the Earth's Interior, IUGG, p. 27. Information Contacts: G.A. Andal, Commission on Volcanology, Quezon, Philippines. The Global Volcanism Program has no Weekly Reports available for Didicas. "Air reconaissance Didicas Volcano on Babuyan Island 27 March reported eruption. Present activity at northern portion of island formed crater measuring 20 m at bottom, filled with muddy boiling water. Steam clouds without force rising few hundred feet above crater rim. Northern half of island covered by thick whitish-gray ash which also discolors sea fronting eruption site. Commission on Volcanology believes further ash eruption likely to be followed by lava extrusion." Information Contacts: American Embassy, Manila, Philippines. Three persons were swallowed up while fishing near San Vicente, Sta. Ana, Cagayan, yesterday when Didicas Volcano at Didicas Island erupted, according to reports reaching the Commission on Volcanology in Manila from the Cagayan PC. 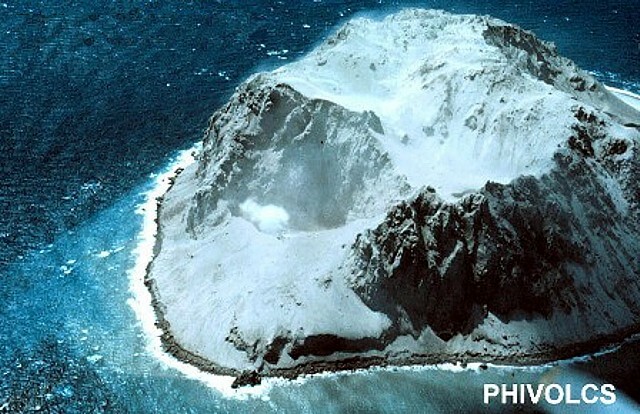 Arturo Alcaraz, chief volcanologist at the Commission on Volcanology, said that Didicas Volcano, which lies 100 km N of Aparri in Cagayan (figure 1), was a submarine volcano until 1952 when it erupted and formed an island one mile and a half in diameter and about 800 feet high above sea level. Figure 1. Sketch map showing the location of Didicas in the Babuyan Islands north of Luzon, Philippines. Commission on Volcanology report after air reconaissance on 28 March, Didicas indicates activity limited to northern portion of island. No ash ejection observed but recent ash falls evident around active crater. White steam rising. Commission on Volcanology expects continued intermittent ash eruption with possible future lava extrusion. Present activity constitutes no threat to inhabitants. "COMVOL air reconnaissance . . . indicated . . . Didicas activity waned from last week's eruption. Newly formed crater exhibiting small fumarolic activity at single point on inner slope. Steaming detected from higher area close to central portion volcano indicating possible activity shift to island's center." Activity . . . has been limited to ash and rock ejection. The volcano's activity is still in its initial stage and a major eruption is possible. Nazario Vasquez made this observation on board this Herald plane which flew over the volcano at 0815 [on 29 March]. The spasmic ejections consisted of rocks which the volcano emits through a vent opened during the earlier stages of its present activity. Signs that the volcano was building up pressure were manifested by continued rise and extrusion of ashes and steam from a crater on the northern side of the islet. If the activity of the volcano continues, Nazario said, there would probably follow an extrusion of lava. Commission of Volcanology records showed Didicas has erupted violently in the past. "Spines" have formed some 14 nautical miles off Camiguin Island north of Cagayan about 1856. These spines were above-the-sea-level expressions of a submarine volcano. Subsequent eruptions formed these rocks into an islet now known as Didicas. A volcano eruption in 1952 caused the formation of an islet 800 feet high and about a mile in diameter. During the air reconnaissance survey, white steam was observed rising from the mouth of the crater in the northern portion. Nazario said there was a possibility of an undersea crater which could give vent to steam and lava. The following message from the Calayan Weather Station was relayed by the Weather Bureau. "Didicas volcano seen emitting thick smoke yesterday (31 March) visible eastern part Calayan. People worried. Please advise immediately -Signed Singson." The following evalution of the Didicas activity was furnished the Weather Bureau for transmittal to Calayan. "Commission on Volcanology believes Didicas activity to continue for some time yet. Further ash eruptions expected, but will not adversely affect Calayan or nearby islands. Allay people's fear also concerning tidal waves. Their occurrence considered only a remote possibility and even then their effects likely will be negligible to settlements of Babuyan Islands and northern Luzon." The current eruption of Didicas Volcano was observed to have waned from that of last week's recon findings. The activity in the newly formed explosion crater at the northern end of the island volcano has quited down to just small fumarolic activity at a point on its inner slope. However, steaming was detected from a higher area close to the central portion of the volcano. This may indicate that the point of activity can be shifting towards the center of the island. Card 0484 (01 April 1969)Manila Times, Manila, Philippines (27 March 1969). Card 0487 (03 April 1969)American Embassy, Manila, Philippines. Card 0490 (08 April 1969)American Embassy, Manila, Philippines. Card 0506 (17 April 1969)Rogelio Razon, The Philippines Herald, Manila, Philippines (29 March 1969). Card 0514 (24 April 1969)Arturo Alcaraz, Commission on Volcanology, Manila, Philippines. Card 0515 (24 April 1969)Arturo Alcaraz, Commission on Volcanology, Manila, Philippines. Didicas volcano, 22 km NE of Camiguin Island, was a submarine volcano prior to 1952, when a permanent island was formed. Didicas now consists of a small, 244-m-high andesitic lava dome about 1.4 km in longest exposed dimension. A 400-m-wide crater was formed during the 1952 eruption. The first recorded submarine eruption of Didicas was in 1773. The first recorded subaerial cone reached a height of 213 m in 1860, after a four-year-long eruption, but soon was eroded beneath the sea. Three rock masses up to 82 m high were left after an eruption in 1900. Two eruptions have occurred since 1952 at an explosion crater on the northern side of the island. Alcaraz A, Abad L F, Tupas M H, 1956. The Didicas submarine volcano. Proc 8th Pacific Sci Cong, 2: 139-156. Defant M J, Maury R C, Joron J, Feigenson M D, Leterrier J, Bellon H, Jacques D, Richard M, 1990. The geochemistry and tectonic setting of the northern section of the Luzon arc (the Philippines and Taiwan). Tectonophysics, 183: 187-205. There is no Deformation History data available for Didicas. There is no Emissions History data available for Didicas. An aerial view shows the small, 244-m-high island of Didicas. Didicas volcano, 22 km NE of Camiguin Island, was a submarine volcano prior to 1952, when a permanent island was formed. A 400-m-wide crater was formed during the 1952 eruption. The first recorded submarine eruption of Didicas was in 1773. Two eruptions have occurred since 1952 at an explosion crater on the northern side of the island. There are no samples for Didicas in the Smithsonian's NMNH Department of Mineral Sciences Rock and Ore collection. Large Eruptions of Didicas Information about large Quaternary eruptions (VEI >= 4) is cataloged in the Large Magnitude Explosive Volcanic Eruptions (LaMEVE) database of the Volcano Global Risk Identification and Analysis Project (VOGRIPA).